Sun Valley Resort staff and guests said goodbye over the weekend to one of the resort’s iconic establishments, the Lodge Dining Room in the Sun Valley Lodge. After being the resort’s premier dining destination for decades, the Lodge Dining Room hosted a final dinner on Saturday, followed by a final brunch on Sunday. At the private invite-only dinner, 166 guests shared one last meal filled with memories and stories. In March, the Holding family—which owns the resort—announced that the Lodge Dining Room would be repurposed to make room for a spa. The spa remodel and addition is part of a broader project to remodel the entire lodge. 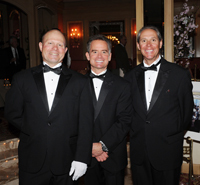 Former resort executive Claude Guigon—who ran the dining room from 1980 to 1998—was in attendance Saturday, along with four of his former waiters who came back to serve many familiar guests for one last night. After buying Sun Valley Resort in 1977, businessman Earl Holding made it a priority to turn the Lodge Dining Room—which had been converted into a convention room—back into a five-star formal dining room. As maître d’ for opening night of the dining room on Dec. 19, 1980, Erich Steinbach said the Holding family sought to model the expansive room after the formal dining room at the Westgate Hotel in San Diego, Calif.
Steinbach later went on to serve the Holding family as the Westgate Hotel’s food and beverage director, and then got promoted to general manager. He said that his experience working at the Lodge Dining Room was a great steppingstone for his career. Valley resident Brian Poster was one of four former waiters in the Lodge Dining Room in the 1980s who returned to work one more night on Saturday. He shared Steinbach’s sentiments of looking back on his time at the dining room as an integral element to his own business success. In addition to Poster, Jeff French, Grady Burnett and Rick Hoffman are former waiters who worked under Guigon and returned to wait tables one last time on Saturday night. After dinner, all of them enjoyed a beer with Guigon in the lodge lobby, where they reminisced and shared what Poster called a very special moment together. “Claude was definitely the heartbeat of the Lodge Dining Room,” Poster said. While Guigon said he is disappointed that the tuxedo and white-glove formal dining that the Lodge Dining Room was known for has lost popularity, he understands that many people desire a more casual dining experience. Guigon said he has many memories of serving celebrities and household names. One of the keys to the dining room’s success over the years was how the staff treated everyone with the same level of service, he said.